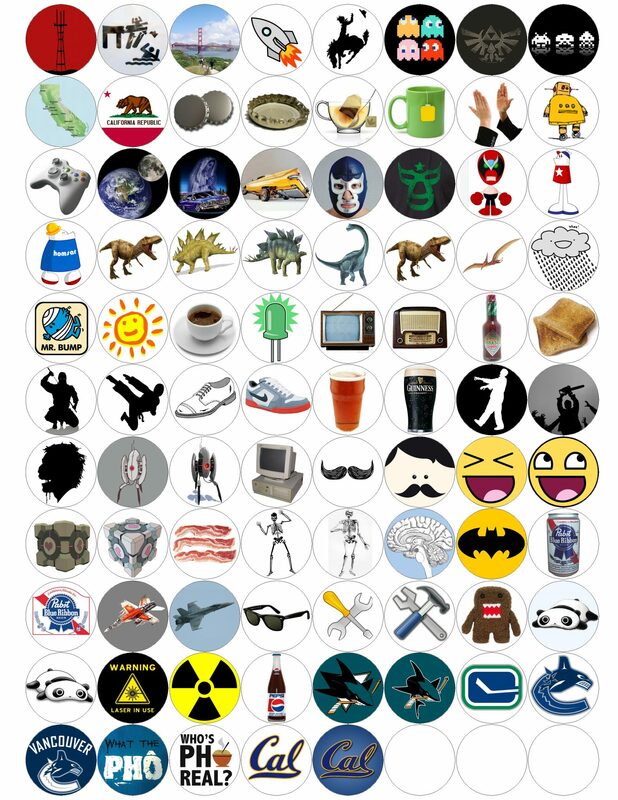 Let’s face it, button pins make everything more awesome. 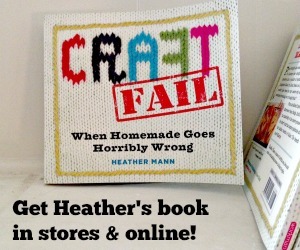 I’ve seen street vendors and trendy hipster stores sell custom pins for a few dollars each. I figured I could make my own easily enough and would make great gifts for friends, the best part is that I can customize each button so it’s personal to each recipient. 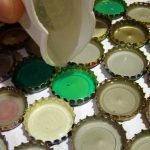 This project uses old bottle caps as the base for each pin, clear casting resin to hold the image in place and a regular safety pin to affix it to your clothes. 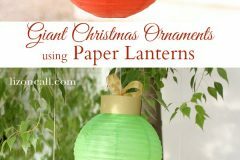 This inexpensive and fun project is sure to delight everyone. Did I mention it’s customizable? It bears repeating because it’s just so amazing! 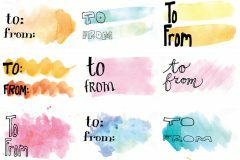 I brainstormed image ideas that I thought would be easily understood at a quick glance. I scoured the internet for images and dumped them into an imaging editing software (GIMP is great free image editing tool). In your image editing software set up a new work space with the same dimensions as standard printer paper, A4 [8.5″x11″]. 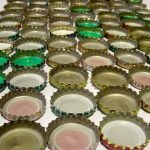 The inside diameter of the bottle caps were measured at about 25mm [1″]. In the image editing software I set up a simple grid template of circles with the same diameter as my bottle caps. Accounting for printing margins I got about 8 circles across and 11 deep. 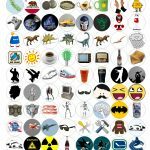 Each image I found from the internet was copied onto the circle template. I’ve provided the sheet I used, feel free to use it as-is or as a template for your own images. When your template is full of images print in colour and then cut out each circle. 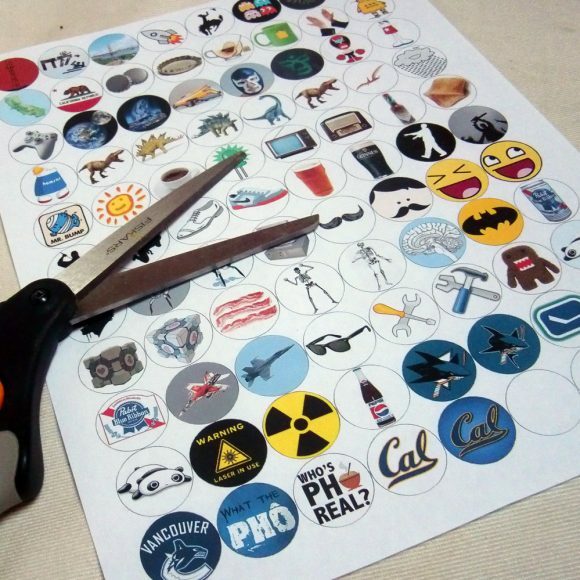 After cutting place one circular image cut-out in each bottle cap. I got my caps from a local bar, I asked nicely and they set aside the caps for me. After a busy weekend I had more bottle caps than I knew what to do with! 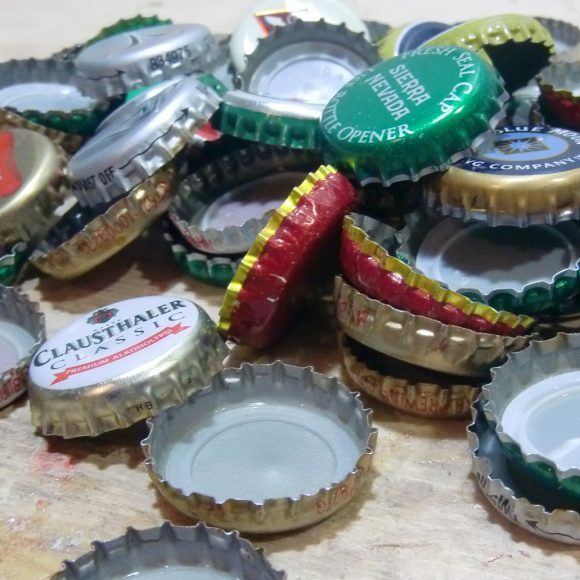 Since I got my bottle caps from a bar, they reeked of beer and regret. So, I tossed all the dirty bottle caps into a large bowl with warm, soapy water and let soak overnight. In the morning I cleaned and rinsed the caps, then left them on a towel to dry. After, I sorted out the really bend or damaged caps, and tried to re-bend all the misshapen ones. Following the directions from the package of EasyCast, I warmed the resin and hardener bottles in warm water for a few minutes. Then I poured equal amount into separate disposable cups (exact measurements are important, do not ‘eyeball’). When equal portions have been measured out, combine into one cup and stir for 2 minutes. Ensure sides, bottom and stir stick itself have been incorporated into the mixing, resin mixture must be homogeneous. After mixing pour contents into a new clean disposable cup and mixed for another 2 minutes with a new stir stick. After secondary mixing the resin is ready to be poured. 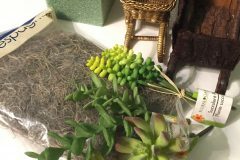 Use resin immediately, as the chemical reaction has begun once mixed and will begin to harden. 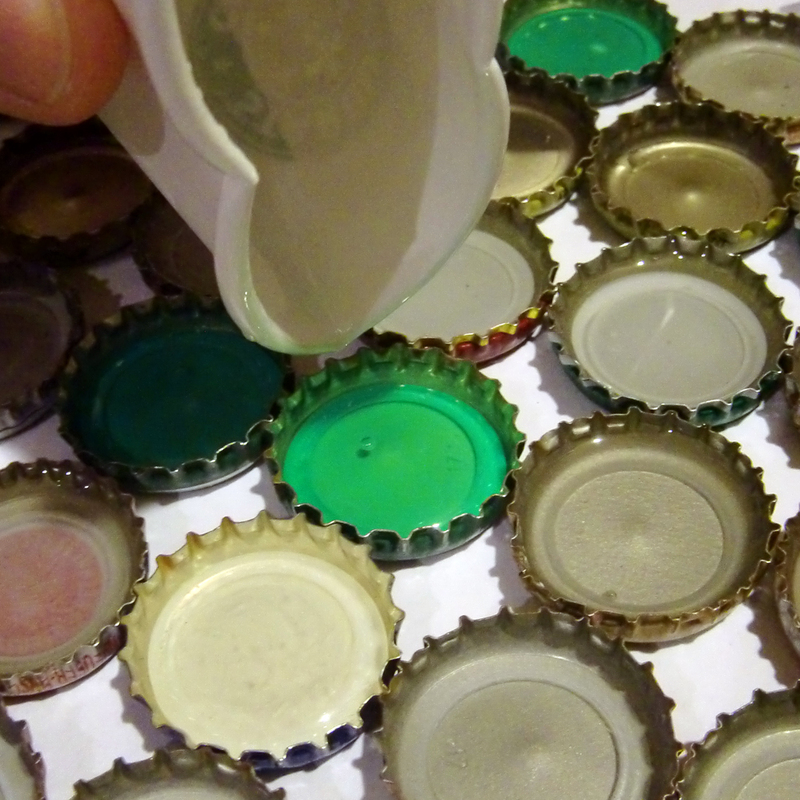 The resin was carefully poured into each bottle cap, filling only about halfway. 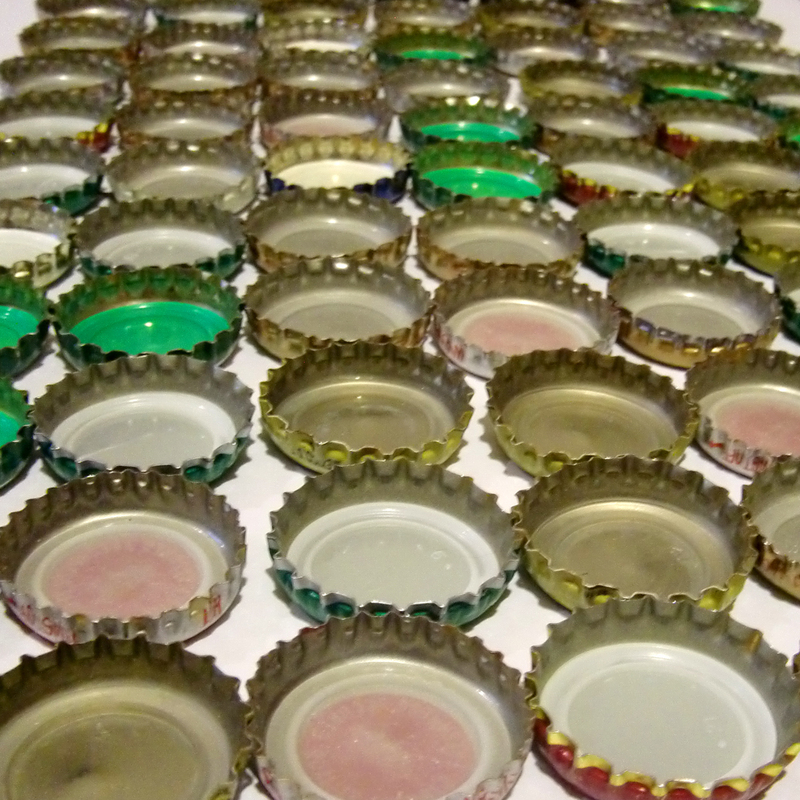 I used about half of the resin and hardener for my 80 caps (each bottle is 4oz [120ml] and I used 2oz [60ml]). After pouring I went back with a new stir stick and poked down any images that had floated to the top or were otherwise misaligned. Allow resin to cure overnight. After the resin has cured it’s time to attach our pins. The reason this is done after the resin has been cast is that we needed the bottle caps to lie flat when casting to ensure a level surface for each pin button. All bottle caps have a logo or image on the top, to ensure good contact for our solder each cap needs to be sanded to remove this logo, allowing the solder to have good contact. 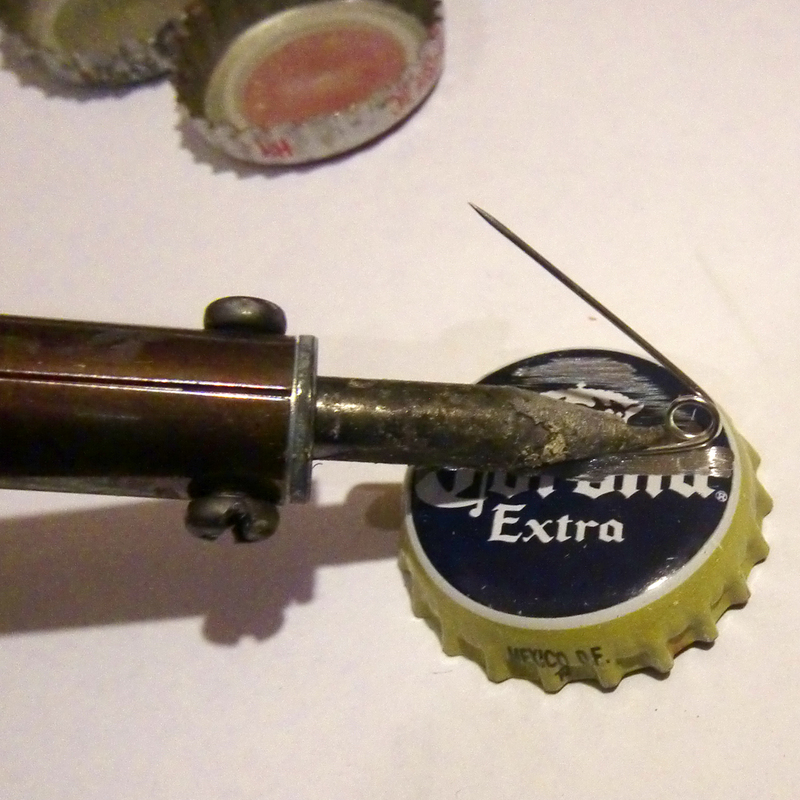 No need to sand the entire top of the cap, just a strip where the safety pin will be. Leaving some of the logo or image adds a neat bit of flair to an otherwise boring pin back. Using fine sandpaper (100grit) or a rotary tool, sand away a strip on the back of each pin to reveal bare metal, then solder on a safety pin to the back. Repeat for each pin. All that’s left is to pin your new buttons to your favourite jacket, bag or whatever else you wear! 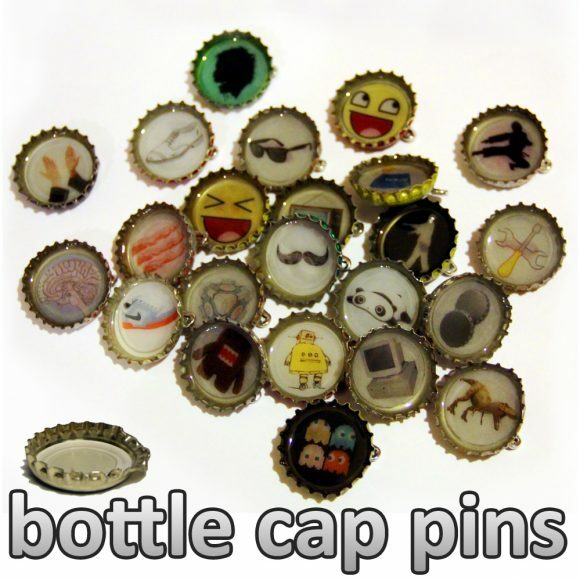 So, what are you going to pin your bottle cap buttons to? Cute idea! And you don’t even need a button machine. 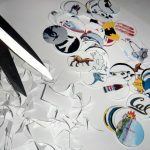 Your images look a little cloudy, did you seal them with mod podge before pouring the resin? the mod podge will also work to glue the images to the bottom of the caps so they dont float up, and you should be able to get a nice domed look to the resin that way. 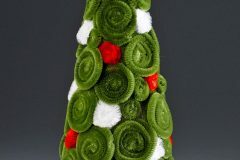 Magnets on the back would also be a good alternative to pins, and they would make cute refrigerator magnets, and for people who like a little more flair you can buy specially patterned/colored bottle caps at a craft store like Hobby Lobby. I saw some a few weeks ago, and they even had ones with bails already on them in the jewelry section to make pendants.